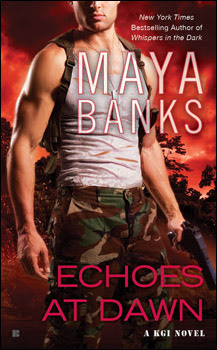 Echoes at Dawn finishes out the short story arc pertaining to the Peterson sisters, their psychic abilities, and some Big Bad Conspiracies that involve nameless organizations chasing after them wanting to exploit said abilities. The story arc began in the previous book, Whispers in the Dark wherein the younger Peterson sister, Shea, somehow reached out to Nathan Kelly while he was in captivity somewhere in Afghanistan. Saving Nathan's life in turn gave her hope at being saved herself as well as helping older Peterson sister, Grace. Grace's story is somewhat less chaotic with fewer tangents. And while there were a lot of quibbles about this book that crossed my mind, in the end, I have to admit that I really enjoyed reading the book... if only because it possesses the same familiar feel-good formula for a Happily Ever After™. I do appreciate that while it seemed that Grace started off in a broken, weakened, reliant, damsel-y state, her determination allows her to grow into a stronger person--probably the same strong woman she had been, running alone, before being tortured until she couldn't stand to live much longer. Grace Peterson had been captured and tortured because of her ability to heal others, even at the cost of her own welfare. During a random attack on her captors, she has managed to escape and has been on the run for some time. At the end of her limits, KGI team leader Rio and his men have finally caught up to her on their mission to bring her home safely to her sister. But there is some other deeper conspiracy at work as well as another rogue black ops unit on their trail. Feeling a strangely immense protectiveness for Grace upon their meeting, Rio is wary and reluctant to further move Grace into danger until he understands the situation. So he and his men retreat to his hidden, private sanctuary so that they can regroup and figure out what's going on as the best course of action in keeping Grace safe and alive. The story line of Echoes at Dawn is pretty straight forward once we find out who the Big Baddie is early on in the story. A rich and terrible man is about to lose his beloved daughter to a cancerous illness and is desperate to do anything to save his little girl's life, even at the cost of others. So he contracts the elite men of a black ops unit called Titan to help him find and bring Grace Peterson to him so she can help his daughter. As part of the background to this story, Grace is also supposedly still being pursued by various secret government agencies who want to exploit her abilities, or put her in a lab to run experimentation. Either way, no matter where Grace goes, she won't be living a normal human life of freedom. In the previous books, Rio comes along and automatically volunteers to help retrieve Grace... for reasons. It is this, the romance of the book, that starts getting a little shifty. Because, to be totally honest, the main conflict is actually pretty exciting, even though there's very little story to tell. At this point in the series, I've realized that the KGI books have become somewhat of a guilty pleasure of mine, because good storytelling and sensible narration it is not, but fun and emotional and feel-good and all sorts of lovelies it is. As is par for a KGI installment, we've got readily likable characters, immense FEELS in the character interaction, and despite the romances being a little hard to accept, the rest of the storyline is exciting, enjoyable, and lots of fun. So I'm willing to overlook the repetitive monologue-ing, tacky dialogue, deliberate descriptions and actions that are enforced to emphasize specific character traits to the reader, as well as the "Fated to Be True Love Forever and Ever" love story. I take issue with the romance only because I'd rather see two people grow to develop feelings for one another (even if the "getting to know you" phase is short) rather than just falling in love because the story dictates it to be so. While I believe that love at first sight is possible, it just isn't really realistic. And the fact that Rio and Grace just "know" that they were meant to be together due to some sort of strange psychic connection seemed a bit insta-love, even if it technically really isn't insta-love. But whatevs, the book was exciting and I liked it all the same. There were moments of drag and then there were moments of excitement and then there were just Moments... even in spite of the tacky dialogue. The introduction of another black ops unit as well as the character of Hancock was a nice new twist and I have a feeling we'll be seeing more of him in future books. The conclusion was rounded out pretty well and we get the standard Happily Ever After™ for all as we conclude the psychic Peterson sisters story arc. There were lots of feel good moments... and maybe that's all that matters to me, really. I sure did miss seeing most of the Kelly family, that's for sure. And Rusty seems to have grown up overnight from a belligerent teenager into a young woman going off to college... How much time as passed since the previous book? I guess she did graduate from high school the last time we saw her.